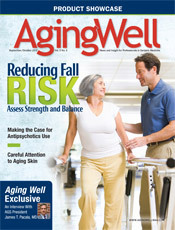 Older adults are seven times more likely than younger adults to require hospitalization resulting from adverse drug events (ADEs), with nearly 100,000 such hospitalizations reported each year.1,2 With a growing older adult population in the United States and 40% of people over the age of 65 taking five to nine medications and 18% taking 10 or more,3 there is a tremendous need for increased coordination of efforts among patients, caregivers, and healthcare providers to effectively manage, monitor, and communicate pharmaceutical care issues to help minimize ADE risks, including hospitalizations. Warfarin is a vitamin K antagonist used to reduce blood clots by blocking the formation of vitamin-K dependent clotting factors. It is commonly prescribed for people with atrial fibrillation or prosthetic heart valves as well as those who have suffered heart attacks and to treat or prevent venous thrombosis and pulmonary embolism. Warfarin is a narrow therapeutic medication requiring routine monitoring and dose adjustments. Prothrombin time (PT) is used to measure warfarin’s effectiveness and reflects the time it takes for clot formation to progress. PT values can vary between labs, depending on the thrombin sample used. The International Normalized Ratio (INR) is calculated from the PT to standardize values across labs. Higher INR values reflect a longer time required for blood clot formation with excessive dosing of warfarin resulting in higher INR values and increased risk of serious bleeding. Inadequate dosing results in lower INR values and a greater potential for fatal blood clots. Most patients generally receive INR monitoring every two to four weeks; however, the recommended frequency of INR monitoring should be individualized and depends on numerous factors, including whether warfarin has recently been started or there have been recent dosage changes; whether the patient’s INR has been stable; the addition or removal of other medications known to interact with warfarin; dietary changes; and acute illness. Numerous drug interactions between warfarin and other medications are of great concern due to increased bleeding risks and may prompt the need for avoidance of the interacting medication, increased INR monitoring, or warfarin dosage reductions (see table 6 on page 10 for common warfarin drug interactions). Vitamin K is used to reverse the effects of warfarin, with vitamin K’s full anticoagulation benefits occurring within about 24 hours after oral administration. Oral vitamin K is preferred in most situations due to more predictable bioavailability, quicker onset compared with subcutaneous dosing, patient convenience, and improved safety. Doses greater than 10 mg should be considered excessive since higher doses do not reverse anticoagulation faster and may cause weeks of warfarin resistance. It is important for patients to maintain a diet that limits vitamin K-containing foods, such as green leafy vegetables, since they can interfere with warfarin’s effect. • Prescribers should use validated decision-support tools (paper nomograms or computerized dosing programs). • Patients healthy enough to be treated as outpatients should receive a loading dose of 10 mg daily for two days, with warfarin dose adjusted based on INR. Some at-risk patients, such as the elderly, may need a loading dose of 5 mg or less. • Patients with previously stable INRs with a single out-of-range INR of ≤ 0.5 below or above therapeutic range should continue the current dose and INR testing within one to two weeks. • A therapeutic INR range of 2.0 to 3.0 (target INR of 2.5) is preferred rather than a lower (INR < 2) or higher (INR 3.0 to 5.0) range. • Patient self-management rather than usual outpatient INR monitoring is suggested for patients who are motivated and demonstrate competency in self-management strategies, including use of the self-testing equipment. • Patients with stable INRs may require less frequent INR monitoring (ie, every three months). — Mark D. Coggins, PharmD, CGP, FASCP, is the national director of clinical pharmacy services for more than 300 skilled nursing homes operated by Golden Living. He was recognized by the Commission for Certification in Geriatric Pharmacy with the 2010 Excellence in Geriatric Pharmacy Practice Award. He is a director-elect on the Board of the American Society of Consultant Pharmacists. 1. Budnitz DS, Pollock DA, Weidenbach KN, Mendelsohn AB, Schroeder TJ, Annest JL. National surveillance of emergency department visits for outpatient adverse drug events. JAMA. 2006;296(15):1858-1866. 2. Budnitz DS, Lovegrove MC, Shehab N, Richards CL. Emergency hospitalizations for adverse drug events in older Americans. N Engl J Med. 2011;365(21):2002-2012. 4. Nau KC, Lorenzetti RC, Cucuzzella M, Devine T, Kline J. Glycemic control in hospitalized patients not in intensive care: beyond sliding-scale insulin. Am Fam Physician. 2010;81(9):1130-1135. 5. Holbrook A, Schulman S, Witt DM, et al. Evidence-based management of anticoagulant therapy: Antithrombotic Therapy and Prevention of Thrombosis, 9th ed: American College of Chest Physicians Evidence-Based Clinical Practice Guidelines. Chest. 2012;141(2 Suppl):e152S-184S. 6. Heneghan C, Ward A, Perera R, et al. Self-monitoring of oral anticoagulation: systematic review and meta-analysis of individual patient data. Lancet. 2012;379(9813):322-334. Avoid if possible due to serious bleeding risk. International Normalized Ratio (INR) once per week. Avoid if possible. Validate need with culture and sensitivity (C & S) prior to initiation. Reduce warfarin dose by 50% during treatment and one-week post DC. INR every other day. Elevated INR often delayed. Avoid combination when possible. Validate need with C & S prior to initiation. An increase in INR is typically seen within one week. Monitor INR every other day. Increased effects of warfarin and/or phenytoin. Obtain baseline phenytoin level. Monitor INR routinely with lower range goal INR. Increased INR is dose related; however, interaction can occur at low doses. Increased INR also noted with use of vaginal and topical miconazole. Monitor INR whenever dose started, stopped, or changed. Use should be avoided with warfarin if at all possible due to dramatic increases in INR and bleeding risk. Monitor INR closely every other day and whenever therapy started or stopped. Significant increased risk of bleeding. Combination should be reserved for diagnosis with clear benefit (eg, acute coronary syndrome, mechanical valves, or recent bypass surgery or coronary artery stents). Monitor INR closely and adjust warfarin dose as necessary. Reduce or hold warfarin dose until INR within therapeutic (goal) range. Reduction or holding of warfarin may not be needed if INR is only slightly elevated. Patients should not routinely receive vitamin K. Hold warfarin dose for one to two doses and resume at lower dose when INR is within therapeutic range. If urgent surgery is needed, give 5 mg or less of vitamin K with an additional 1 to 2 mg in 24 hours, if needed. If bleeding risk is high, give 1 to 2.5 mg vitamin K orally. Hold warfarin dose and give 2.5 to 5 mg vitamin K orally, even if no bleeding. Resume warfarin dose once INR is therapeutic. Recommend rapid reversal of anticoagulation with four-factor prothrombin complex concentrate rather than with plasma. Suggest the additional use of vitamin K, with 5 to 10 mg administered by slow IV injection rather than reversal with coagulation factors alone.